Spaceman, Beast, Demon, Lover – KISS 3000! PAN’S LABYRINTH smashed up against the Cantina Sequence from STAR WARS and Guillermo del Toro rode that bad boy all the way to a town called HELLBOY. In HELLBOY II: THE GOLDEN ARMY, writer-director del Toro has concreted his gleaming vision, found his devil stride, piling spectacle upon wonder upon bombastic fantastic. From Mike Mignola’s comicbook character, with Ron Perlman reprising his red-skinned lead role (his insouciance outa control), and eye-candy enough to choke a fragglewump, we almost touch heaven. And the fact that Danny Elfman composes the score is just So Right. Throw in Barry Manilow (Can’t Smile Without You) and it’s hell in a leather longcoat. Prince Nuada (played with sneering British contempt by accomplished music artist, Luke Goss) is the non-human albino guy so rampantly pissed at humans and everything else that we surmise he never got enough hugs as a child. (Yet if he hates humans so much, how come he’s always speaking English when everyone in the underground kingdom is speaking Undergroundese?) Kills his king dad for a piece of crown to wake the Golden Army; has to kill his albino sis (Anna Walton) for the last piece, but she lams it with Abe Sapien (Doug Jones, still blue and gilled and ineffectual as a fish-guy), who immediately falls in love with her even though she’s another species. In HELLBOY, it seemed like the paranormal was battling to infiltrate the Real World: in GOLDEN ARMY, the paranormal exists side-by-side with us. Del Toro tries to establish a MEN IN BLACK nonchalance during the opening scenes, showing all manner of wackiness in the paranormal academy, while Tom Manning (Jeffrey Tambor) and Abe Sapien walk right past these oddities while chatting. MEN IN BLACK did it better. It is too contrived here, especially when introducing Hellboy and his manic-depressive firestarter chick, Liz (still Selma Blair), in a stagey couple-fight that makes us feel dirty. 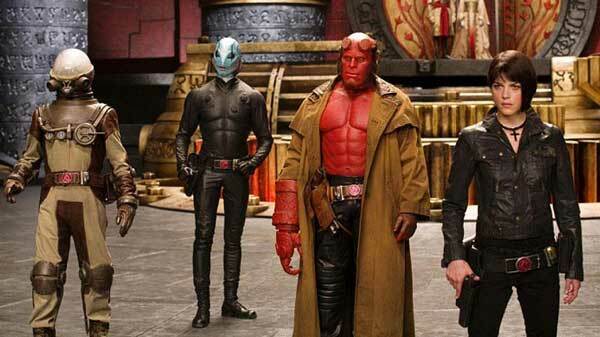 In their quest to stop Nuada, Hellboy, Liz and Abe are joined by “ectoplasmic expert,” Johann Krauss (James Dodd, voiced by Seth McFarlane), who looks like a 1950s movie spaceman. Abe Sapien reminds me of Aquaman from DC’s Justice League – unless evil was being perpetrated underwater, he was pretty useless. Abe is an empath, but he is neither a fighter nor a lover; the mentality of a fifteen-year-old virgin boy, which doesn’t help when confronted by foes like Wink – Nuada’s steel-fisted, ten-foot troll. HELLBOY II moves quickly from one spectacular vignette to the next, many times leaving strands dangling, which is why it has verve, but lacks balls; from the tooth fairy inundation, to the Troll Market (where even 100 viewings would not be enough to assimilate the visually-drooling alienscape), to Hellboy battling an Elemental (a tree-giant forest god that Nuada unleashes to kill Hellboy when he could have simply knifed him instead). During the tree battle, Nuada almost poignantly entreats Hellboy to Come-To-the-Dark-Side, touching on this movie’s theme (which the movie itself runs from like a maniac) – that the very humans Hellboy protects look upon him warily as an outsider. When the forest god dies, it covers the ground with foliage, planting doubt that the humans might in fact be prohibiting Earth-friendly, natural elements from thriving. Before the dissent can wend its way through Hellboy’s filed-down horn-growths, he’s hitting something else with his Five-Fingered Mary. The inevitable TRANSFORMERS moment arrives when the titular Golden Army comes to life – “70 times 70 warriors” (let’s call it 4900 for the mathematically-challenged) – all eye-bending CGI machinery. And Hellboy and Krauss go into battlebot mode while Liz and Sapien stand around and hope we don’t notice them doing nothing behind the special effects. As in the original HELLBOY, these dead-end moments are many, where del Toro drops story threads and hopes he will get by on spectacle alone. But if Abe Sapien can learn to cry (even though he has no tear ducts), I’m sure del Toro will one day learn to balance spectacles and testicles. 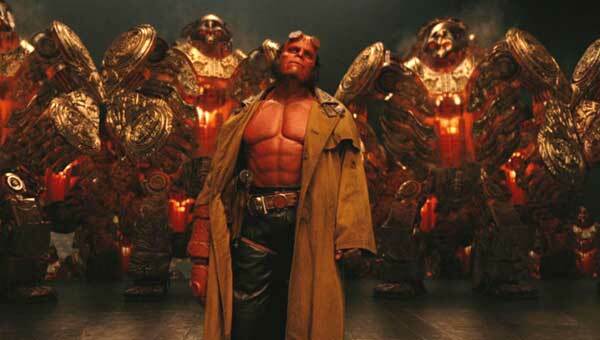 aka: HELLBOY 2 THE GOLDEN ARMY. Writers: Mike Mignola, Guillermo del Toro. Starring: Ron Perlman, Selma Blair, Jeffrey Tambor, Doug Jones, John Alexander, James Dodd, Seth McFarlane, Luke Goss, Anna Walton, John Hurt, Brian Steele.